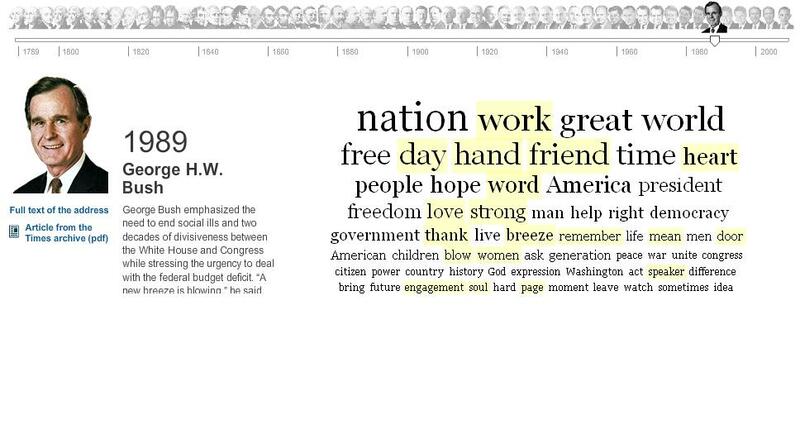 The New York Times featured a great interactive graphic on presidential inaugural speeches. The graphic uses larger fonts to show frequently-used words. The interactive infographic also highlights the words that are used more often relative to other addresses. Links are included to the speeches so you can verify the math. Not crazy about the font-sizing method, but it seems to work pretty well in this instance. I’m wondering if a stacked line chart with an optional filter would relative frequency better. Similar to that employed by the Baby Name Voyageur. Which method would you prefer?